(http://www.lionbrand.com/yarns/hometownUSA.html?categoryKey=1694622&start=0&pageLength=15) seemed the best choice for my needs. The colors were mostly clear and crisp, it did not fray or pill while stitching. The white stitched well but would the dark blue do as well without painting? Quick try of the dark blue and I was off to buy yarns. Encroaching Gobelin. 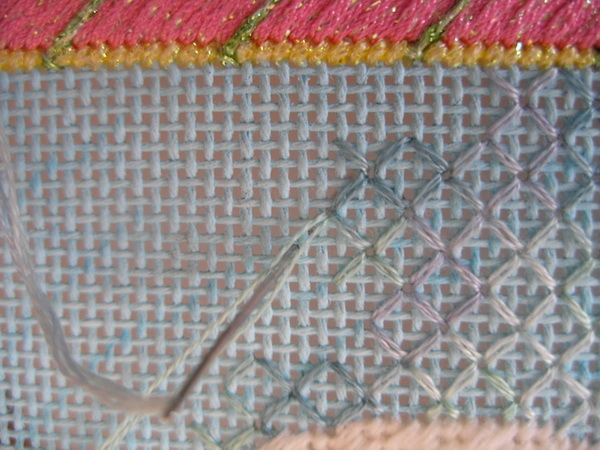 The area is separated with 2 ply green stitched in an outline stitch. overlapping cross stitches and the plaid at the bottem is filled with cross stitches in green and light blue . All used a full strand except cross stitches, they were 2 ply. The arms are wrapped fly stitches using a full strand of yarn and pulled snugly. The candy cane is a full strand of yarn stitched over a padding thread used to raise the candy cane to appear as high as the arms. The wreath was going to be 2 stands of green French Knots filled with a strand of the yellow French Knots but it looked skimpy so I redid using a full strand of the green yarn. The bow was tied on after all French knots are in place and I anchored the knot wit two over stitches and also anchored the ends with French knots. Snow girls is embellished with a store bought button for the hat and twisted DMC Memory Thread for her nose. Finished and hanging by Christmas is not going to happen but it is stitched. I safety pined it to a bag so it can hang and have a present added…after Christmas will send to finisher. I have a friend who stitches pieces and gives to someone for one occasion and then has it finished for another occasion…pretty smart idea considering the cost of some needlepoint…maybe she could stretch it to three occasion gift by giving canvas and threads first, then stitched, then finished…Humm, I wonder if I could try that? This is the end of my Christmas stitching for this year with one exception, I’ll show you that Christmas day. It’s a surprise! 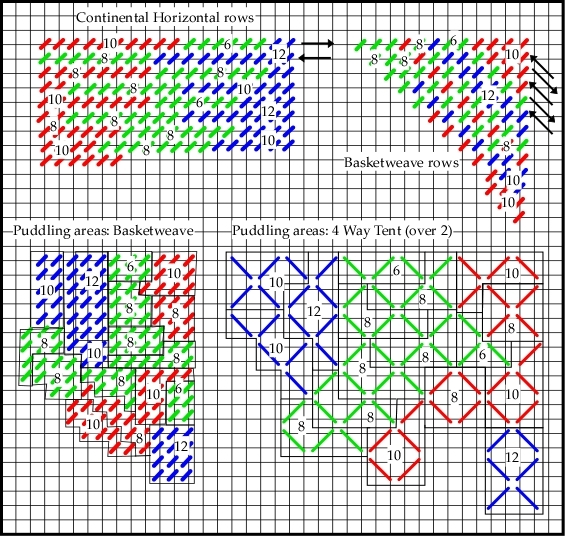 I hope this little project helps anyone with a quick point piece in their stash to find the yarn to stitch their piece. My biggest hope is that the company that has purchased the Paternayan rights will also produce Quick point yarn too. I can dream, but if not I hope Lion brand does not discontinue their bulky line. Good thing our streets are clean and my DH could get out this morning, otherwise we might have had to put sleeping pills in his coffee. I think he was beginning suffering from Cabin Fever, Brain Freeze or Snow Stupor, and maybe a combination of all. Yesterday, out of the clear blue he asked me if I was stitching the bunny because it was the Chinese Year of the Rabbit. I simple answered that I obviously needed to do more shopping, since my 100 or so rabbits with blue coats and carrots collection was too small for him to notice. That sent him to his computer and I did not hear from him until lunch. The then news media announced the Punxsutawney Phil in Punxsutawney Pa didn’t see his shadow and they would have an early spring. Well congratulations to the Pennsylvania folks; I am very happy for them and envious too. Because here in the Midwest, the rodent would have to have been blind not to see his shadow and so I’m guessing with out -10 degree temperatures with a wind chill of -15 it will be at least 6 more weeks until we see crocus and jonquils popping up through this snow. And with this bone chilling weather I am so-o-o-o very happy that I can stitch, compute and read. 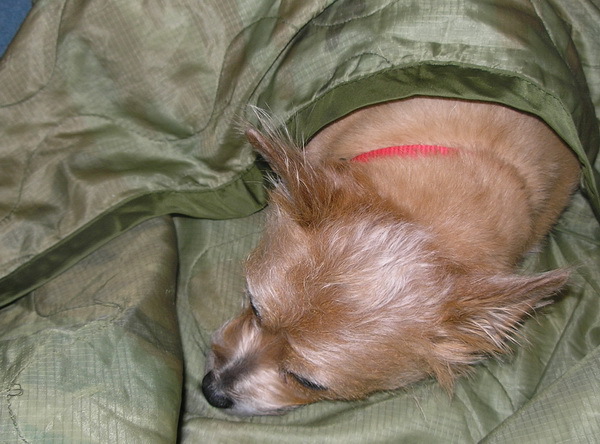 With my blanket (camouflage army liner for sleeping bag supplied by 2nd son from his army days, too warm) shared by Lucy and hot chocolate, I’m as snug as a bug in a rug! I can zone out and only have to face the harsh reality of the snow and cold when either Lucy needs to go out (and that is only when her eyes turn green and she’s walking with all four legs crossed) or I need more hot chocolate, nature or food calls me. The bunny is progressing nicely his coat and tail are completed and I have cut the felt for the tulips. Hopefully, by the end of the today I should be finished with him and he should be heading to the finisher on Friday or Saturday. I do have a problem but it is not with the stitching, it is the materials I am planning on using. I decided the tulips should be appliqued and I am using felt. I had all but the one pink and so last week I headed out to find a pink that I could use. I was open to the possibility that my pink could be the lightest or the middle value. I went to two local national craft stores and then to the national fabric store. The felt is awful compared to what I bought just last year. I purchased one but it is almost paper-thin as you can see in the picture. 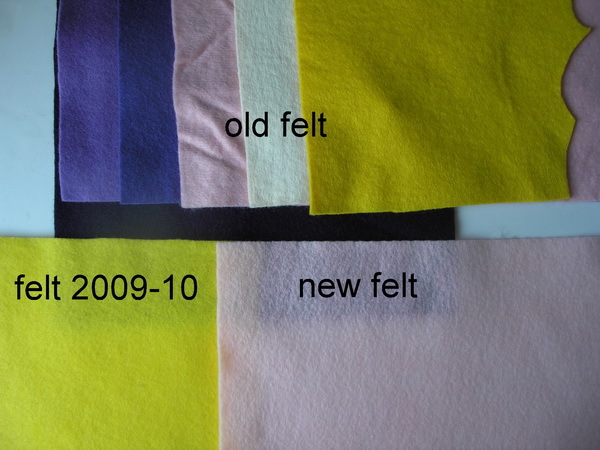 Since I was at the fabric store I checked both in the craft area and the cut fabrics; most of the felts were thinner than ever, some were thicker but you could tell these colors were not the most popular colors and were probably older. When I got home I noticed that felt I purchased last year (yellow) was better than the felt I just purchased but was also a bit lighter than the stuff I’ve had for several years. I took a picture, hope you can see the differences…the top row are felts I have had, yellow is felt I purchased I last two years and pink is the newest. 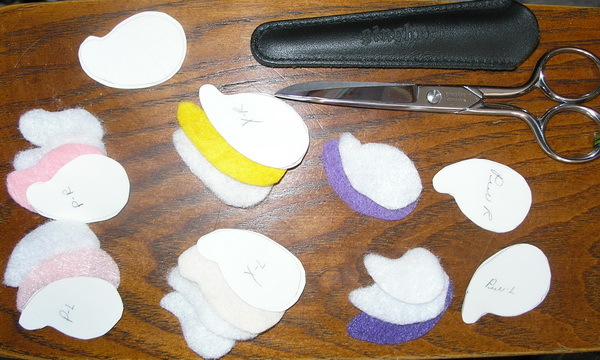 Since I seldom use felt and I have a nice stash of the older felt for my purposes I will have time to research and study other alternatives, but I sure feel sorry for those felt artists that love to work with this media, I thought the felt I saw was of poor quality. If you are a felt designer or artist out there, where do you get your felt and have you seen a difference in the quality of felt? Okay, enough of the felt box stand, back to my stitching plan. 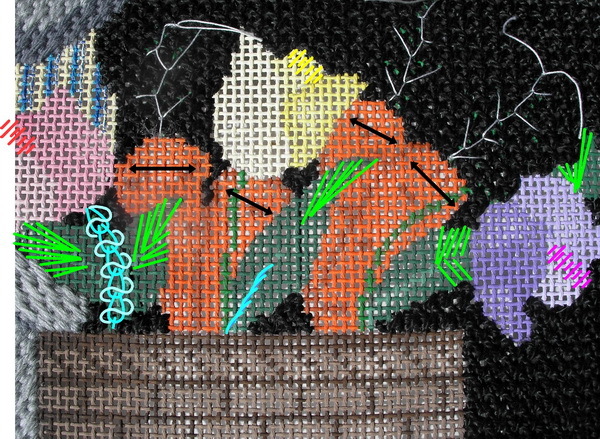 I am planning to stitch the carrots with 2 colors of Epic wool (persimmon and sienna) in padded satin stitches. I’m going to pad the carrots with orange #3 DMC perle cotton. I will slant the stitches on three of the carrots to match the slant they are painted. I am planning on doing the leaves with a Radial Satin stitch using all 3 ply of the Emerald Watercolours as it comes out of the skein (I am NOT stripping this thread). I will then use #3 DMC perle cotton very dark green (890) to place the veins on the leaves in an Outline/Stem stitch when the leaves are completed. I’m going to stitch the center portion of the tulips in a Diagonal Mosaic with a dark value pink, medium value yellow and light value purple #3 DMC perle cotton to blend with my felts. Then I am going to stitch the petals of the tulips using felt and padding. I made one master petal pattern and then adjusted it according to the tulips on the canvas. I have also cut the appropriate padding from quilt batting that I keep for finishing ornaments and padding appliques. 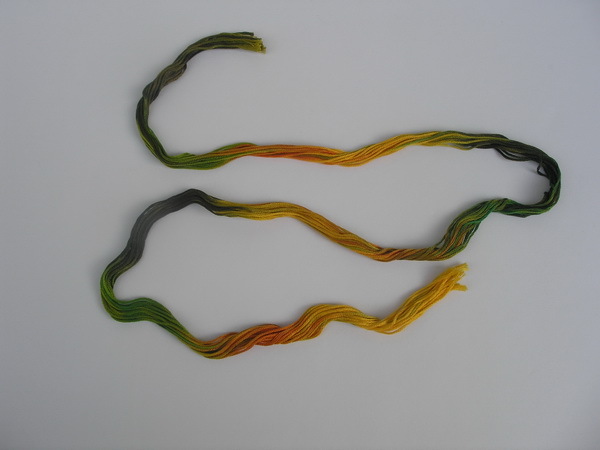 After all the flowers and carrots are complete I plan on stitching the carrot tops in a Fly stitch using 4mm overdyed green silk ribbon; and I will stitch the tulip stems in a Wrapped Chain Stitch using #3 DMC perle cotton very dark green. 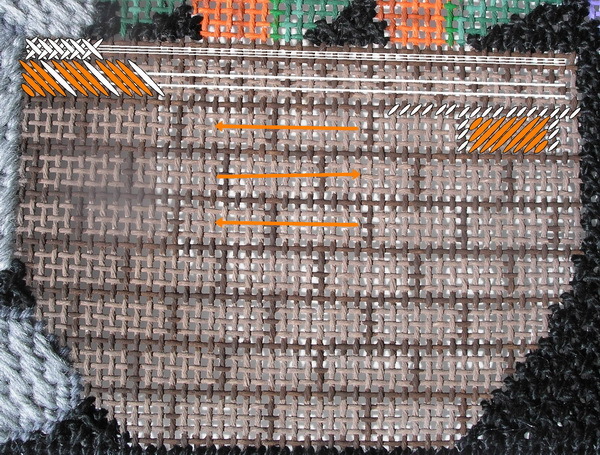 The basket will be stitched with #3 DMC perle cotton very dark brown (838) and Walnut Watercolours (NOT striped). 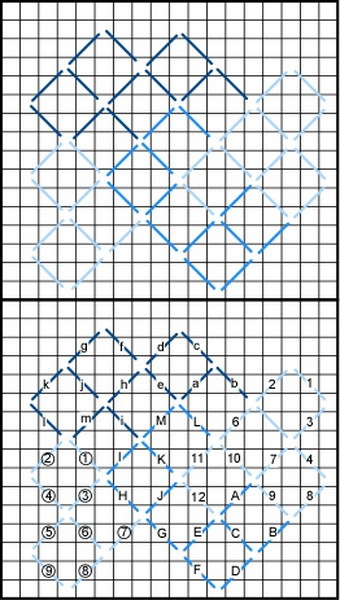 I’m going to pad the very top with dark brown perle cotton 3 or 4 times and cover with an Overlapping Cross Stitch so it will look like a lip to the basket. Directly below this I am going to pad again with perle cotton 2-3 times and stitch a Diagonal Gobelin over this using the dark brown perle cotton very forth stitch and filling in with Watercolours. The body of the basket will be stitched in rows: #3 DMC perle cotton very dark brown (838) used for the Continental Stitch outlines filed with a giant rectangular Flat Stitch using the unstripped Watercolours. Okay enough with the planning, off to get more hot chocolate, and then to some serious stitching today. 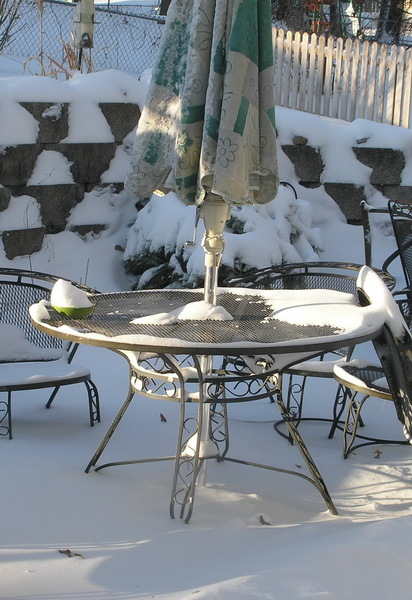 Can’t believe I might have three posts in the same week…see there are some good things to come from cold and snow.